Welcome to TACO MONTH on Hungry by Nature! 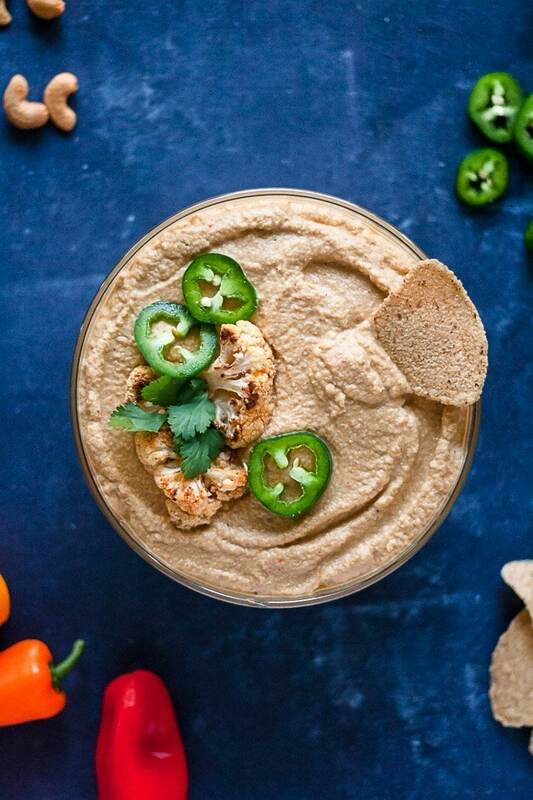 All month long, I am going to be sharing recipes to get you ready for Cindo de Mayo – aka the best holiday ever because holidays dedicated to margaritas, tacos, chips and guac, tortillas, and QUESO cannot be beat. How insanely creamy does that look?! And all without the dairy. After my first and second Whole30, I realized that dairy is not my friend. I can handle small quantities of hard cheese, but definitely not soft and definitely not queso quantity. And ever since then, I have been recreating that ‘cheesy’ flavor in any way possible. 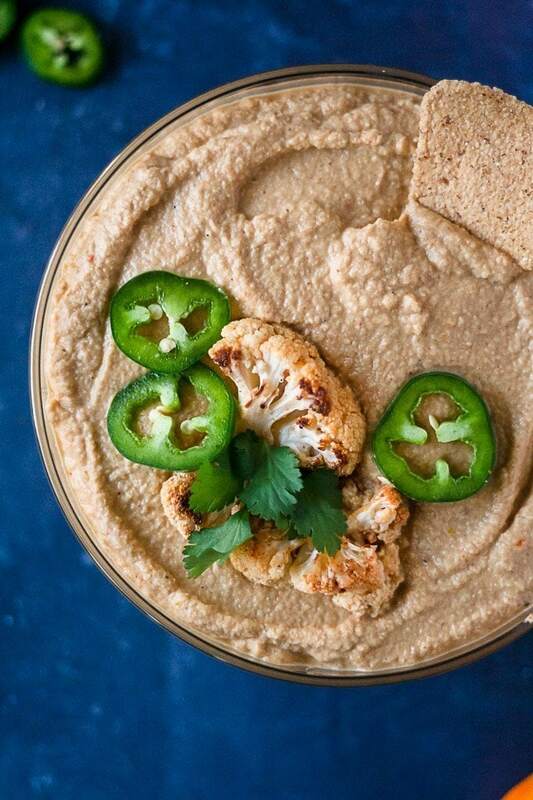 You only need a handful of ingredients for this silky-smooth vegan cauliflower queso! 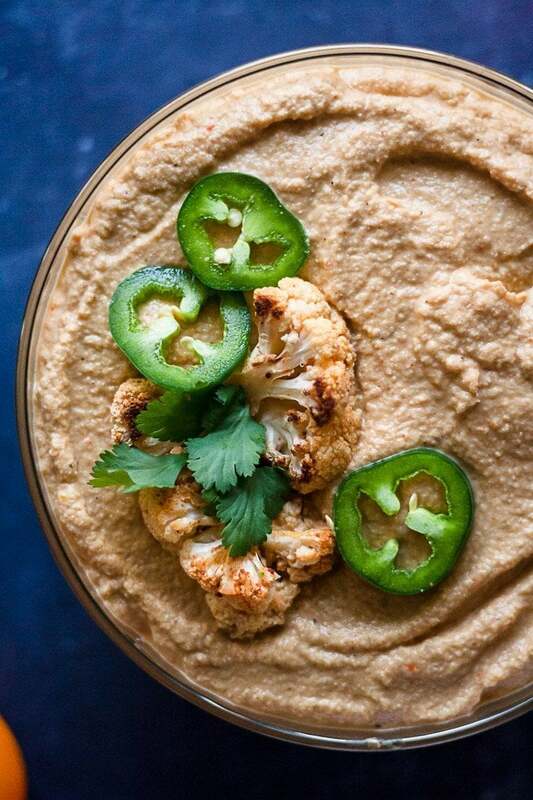 Cauliflower: Roasted with onions in olive oil and taco season, this cauliflower becomes the base for our queso. Cashews: Specifically, soaked cashews! I like to soak mine for at least 4 hours, but you can soak them overnight, or, you can pour boiling water over them and soak them for 15 minutes or so, and you’ll get the same result. The longer you soak, the creamier and dreamier the queso. Especially if you don’t have a high powered blender! Nutritional yeast: I love Bragg’s nutritional yeast to add a cheesy flavor to any dish. All you need is a 1/2 cup to make this queso! Taco seasoning: The taco seasoning is where you can really make this recipe your own. Use your favorite store bought variety (I love Trader Joe’s! but it does contain some sugar so just be careful if you are doing a Whole30) or you can totally make your own blend too. Green chiles: Feel free to use mild, spicy, or a mix of both in this recipe depending on the amount of heat you can handle! I opted for mild because of the spice in the taco seasoning. Can you believe how creamy that is?! The recipe works best if you have a high powered blender – this is the one I have – but if you soak your cashews for long enough, a regular blender should do the trick! 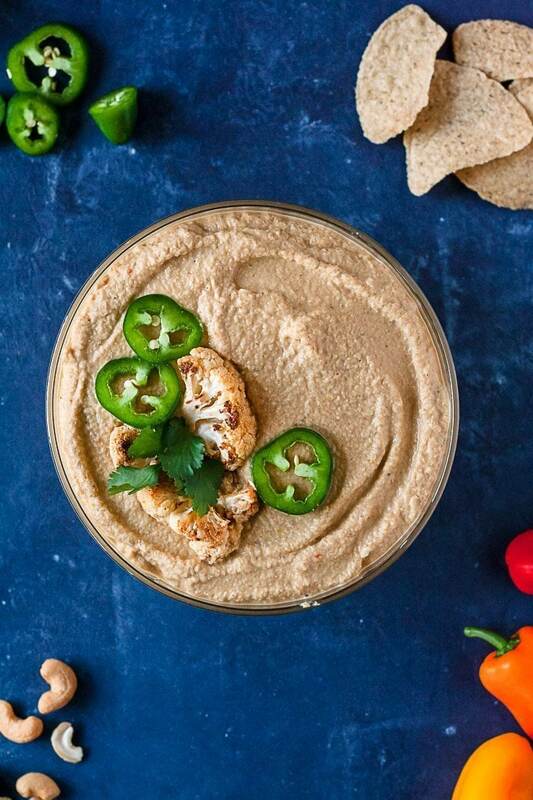 I love to garnish with sliced jalapenos for extra kick and a little cilantro. 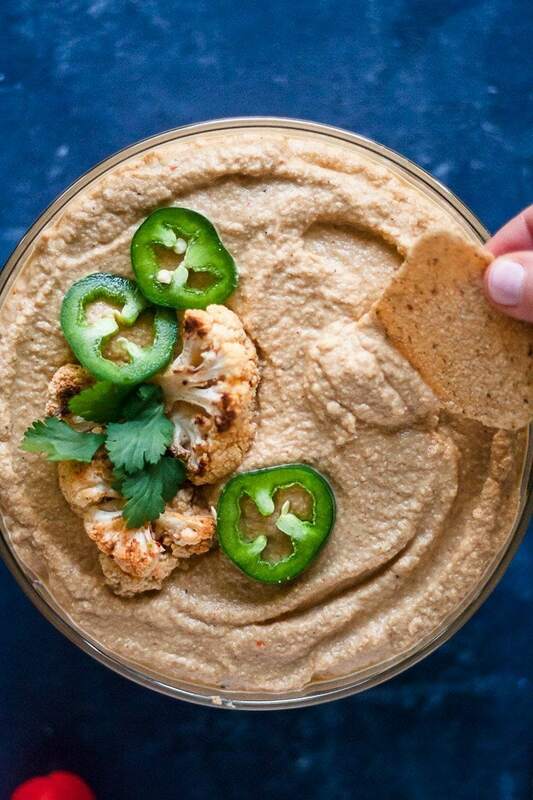 I’m literally salivating just thinking about how insanely good this vegan cauliflower queso is! I really can’t get over how much I love this. It’s SO freaking good. It’s killer on burrito bowls, taco salad, and obvi with chips. And I miiiight have had some by spoonful too. 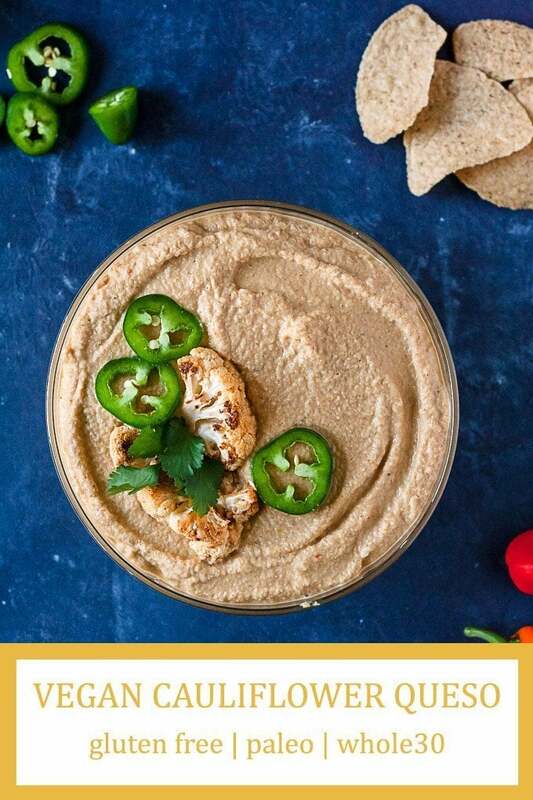 I am so excited for TACO month and I hope you try this Vegan Cauliflower Queso! and don’t forget to tag @imhungrybynature on Instagram when you make my recipes! Make sure you pin this recipe for Cinco de Mayo!